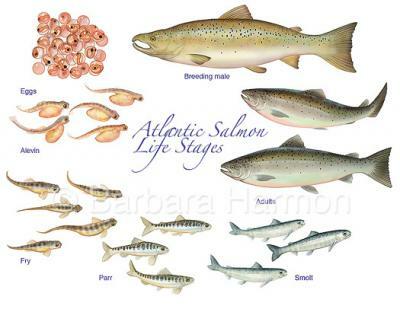 Most Atlantic salmon are anadromous, meaning they undergo their greatest feeding and growth in salt water; however, adults return to spawn in native freshwater streams where the eggs hatch and juveniles grow through several distinct stages. Green egg – Eggs that are less than 48 hours of being spawned. Tender egg – Eggs between the green and eyed stage. Eyed egg – Eggs that have the eyes visible. Alevin – Newly hatched young with unabsorbed yolk sac, also called sac fry. Fry – Salmon that have absorbed their yolk sacs, emerged from the gravel and are ready to feed. Parr – Older juveniles with prominent parr marks. Smolt – Young salmon that are ready to go to sea. Grilse – Atlantic salmon that have spent one winter in the sea and have returned to the fresh water to spawn. Multi-sea-winter salmon – A fish that has spent at least two years at sea before returning to fresh water to spawn. Included are fish that maiden (first time) spawners as well as previous spawners. Kelts (black salmon) – salmon which have spawned and are still in freshwater or returning to the sea. 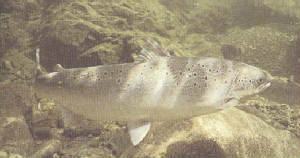 The Atlantic salmon occurs on both sides of the North Atlantic Ocean. In the eastern Atlantic it is found along the European coast from the White Sea, the coasts of Norway, Sweden, and into the Baltic Sea, including Finland and the Soviet Union, southward around the British Isles and the coast of western Europe to the border region of Spain and Portugal (Mino River). It also occurs in Iceland. On the western side it ranges from the Ungava Bay, Hudson and Davis straits, and southern Greenland southward in most rivers along the Labrador coast, Newfoundland, Quebec, and the Maritime Provinces to the Connecticut River (where it has been reintroduced). The Atlantic salmon has established a range in Europe of between 40 degrees and 70 degrees latitude and in North America of 40 degrees to 60 degrees latitude. There is evidence that during one of the warmer inter-glacial periods salmon frequented not only European rivers that flowed into the Atlantic but others like the Ebro, Rhone, and Po that enter the Mediterranean Sea. For maps of Atlantic salmon rivers worldwide visit The Salmon Atlas. The Atlantic salmon is adversely affected by increased acidity of spawning areas caused by acid precipitation. Reduction and/or loss of river stocks has been recorded for some Nova Scotia rivers and for many rivers in southern Norway and Sweden. The Atlantic salmon is an anadromous species, that is, it spawns in freshwater streams, the adults return to sea and the young remain in fresh water for 2 or 3 years. When the fish are about 15 cm in length, the young salmon (smolt) migrate to sea where they may live for 1, 2 , or more years before returning to fresh water to spawn. In Canada, Atlantic salmon spawn in October and November. The actual date depends on the region. Marine salmon move into estuaries and, thence, to fresh water in spring, summer, or early autumn, the approximate time being characteristic for each river. The ability of salmon to surmount falls and other obstacles in the river in order to reach the spawning grounds has been a source of wonder for centuries. To view a video of Atlantic Salmon building a nest and spawning visit Arkive.org. As the adults prepare for spawning, the head of the male undergoes transformation. The head elongates and the lower jaw becomes enlarged and hooked at the tip, forming a kype. The actual nesting site is chosen by the female, usually a gravel-bottom riffle area above or below a pool. While the male drives off other males and intruders, the female, on her side, uses her caudal fin like a paddle and excavates a nesting depression (the redd). Adult female salmon can deposit from 600 – 800 eggs per pound of body weight. The eggs are usually a pale orange in color and measure 5 – 7 mm in diameter. Few animals have attracted as much attention through the ages as has the Atlantic salmon. Etchings of salmon appeared among the 20,000-year-old artifacts of Cro-Magnon man. Prized by the Gauls, then by the Romans, an abundant commercial fish in the British Isles, mentioned in the Magna Carta, revered by the sportsman and esteemed by gourmets, its relation with man has been truly unique. Izaak Walton crowned it the ‘King of Freshwater Fish’ in his 17th century classic, The Complete Angler. The last salmon caught on the Thames is believed to have been in the year 1833. Within one hundred years of exploitation on Lake Ontario, the salmon were gone by the year 1890. In Lake Ontario the erection of mill dams on spawning streams denied access to the salmon. The Atlantic salmon in New Brunswick have suffered from DDT spraying and hydro-electric dam construction. Declining numbers and loss of whole stocks in some rivers are causing increasing concern. Habitat destruction, denial of access to spawning grounds by dams and other obstructions, over-fishing, including high-seas fishing and poaching, pollution, and acid rain are all taking their toll. For centuries, annual migrations of Atlantic salmon provided commerce, food and sport in the British Isles, Europe, Scandinavia and northeastern North America. The Atlantic salmon was a common and prolific fish in the rivers of colonial New England and Eastern Canada. Great numbers were netted or speared for export, food and even field fertilizer. Beginning in the 1600’s, the pressures of dam construction, over-fishing and pollution caused the decline or disappearance of salmon runs across much of its historic range. Salmon that could reach their spawning grounds were often polluted by effluent from industries, which had sprung up during the Industrial Revolution.